This high-tech German engineered CAD-CAM equipment allows us to offer beautiful, strong, naturally coloured restorations in one visit. These same-day, permanent porcelain fillings, onlays and crowns can transform your smile. Most often there are no impressions to go to an outside lab, no temporaries and no repeat visits. Best of all, the procedures may be much more conservative, preserving more of your natural tooth structure and protecting the remaining tooth. We are the only dental practice in the South-East to be able to provide CEREC treatments to our patients. 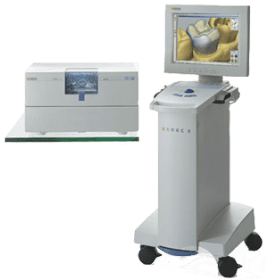 CEREC is the world’s most used dental CAD-CAM system for the fabrication of all ceramic dental restorations in one dental visit! With CEREC, we can complete your permanent, all ceramic crown, onlay, or filling in just one visit! This means fewer shots, less drilling, and less time out of your busy schedule for dental care. And they look great!! Biocompatible, high-grade, anti-abrasive and plaque-resistant. Allows us to save more of the healthy tooth. If you think you could benefit from CEREC dentistry, then call us on 051 421453 and let us help you.